This page will walk through Angular conditional validation tutorial. We perform conditional validation using valueChanges property or registerOnValidatorChange() method. We subscribe valueChanges of a form control to set and clear validators on any field in reactive form and we call updateValueAndValidity() to recalculate the value and validation status of the control. Using valueChanges we can perform conditional validation for built-in and custom validators both in reactive form. We can create custom validator functions using Angular ValidatorFn and AsyncValidatorFn interfaces and we can create custom validator Directive using Angular Validator and AsyncValidator interfaces. Validator Directive can be used with formControlName, formControl and ngModel. To perform conditional validation using registerOnValidatorChange() we need to create custom validator Directive and define this method. registerOnValidatorChange() is the method of Validator and AsyncValidator interface both. registerOnValidatorChange() registers a function that can be executed conditionally to validate a field. Some built-in validator Directives such as required, email can be conditionally enabled and disabled by assigning boolean values using property binding. Here on this page we will provide complete example to perform conditional validation using valueChanges property and updateValueAndValidity() method for reactive form and we will use registerOnValidatorChange() method for template-driven form. valueChanges and updateValueAndValidity() are used for conditional validation in reactive form. valueChanges is a property of AbstractControl that emits an event every time when the value of control changes either using UI or programmatically. updateValueAndValidity() is the method of AbstractControl that recalculates the value and validation status of the control. valueChanges and updateValueAndValidity() are available in FormControl, FormArray and FormGroup classes because they inherit AbstractControl class. valueChanges property has been declared as following. We can see that it returns Observable instance. We can subscribe valueChanges to get data. Here we will perform conditional custom validation by subscribing valueChanges of a FormControl. Now create a reactive user form. Suppose we want conditional validation that username and password cannot be same. First of all create a custom validator using ValidatorFn. In the above custom validator we are matching username and password values and if they don't match, then return null and if they match then return error. Find the getter properties for username and password as following. Now we will create a method inside which we will subscribe valueChanges. By subscribing valueChanges of username and password getter properties, we will set its Validators. Using setValidators() we set synchronous validators and using setAsyncValidators() we set asynchronous validators. Whenever we change value in password field, the password valueChanges subscribe block will execute. Our custom validator pwdMatchUsernameValidator() will execute with current username field value and the password field will be validated. If password is validated against username and then we change username value, then password field must be revalidated. To revalidate password on change of username, we need to go to password valueChanges subscribe block and set validator for password and then call updateValueAndValidity() on password property as following. The above line will recalculate value and validity status for password field. Finally to execute handleFormChanges() method we need to call it inside ngOnInit() method. Suppose we want to validate password and confirm password fields to be same. We will create a custom validator using ValidatorFn as following. Create a getter property for confirm password field as following. Now find the custom validation code using valueChanges property for username, password and confirm password fields. Above code will ensure that password and username cannot match and password and confirm password must match. Our HTML template code snippet of reactive form will be as following. Password cannot be same as Username. To use conditional custom validation with formControlName, formControl and ngModel we need to create custom validator Directive using Validator or AsyncValidator interface. Validator creates synchronous custom validator and AsyncValidator creates asynchronous custom validator. Validator and AsyncValidator has following method declarations. validate(): It validates the value. registerOnValidatorChange(): It registers a function that can be called to revalidate the value. Let us understand how to register a function using registerOnValidatorChange(). Declare a function as following. Register the above function with registerOnValidatorChange(). Now whenever we call _onChange(), it will execute validate() method to revalidate value. Using ngOnChanges() we can track the changes in value of @Input properties of our validator Directive and conditionally we can call our registered function _onChange(). In this way we can achieve conditional validation. We will create a validator Directive for conditional custom validation that password cannot match username. To ensure that if username is changed then password must be revalidated, we are using ngOnChanges() method that executes when any data-bound property of the Directive changes. For any change in changedUsername property of Directive, we are executing _onChange() function to revalidate password. In the same way as above if we want conditional custom validation to ensure that password and confirm password must match, we can create custom validator Directive as following. In the above code inside ngOnChanges() method, we are executing _onChange() function to revalidate confirm password for any change in password. We need to configure custom validator Directive in application module within declarations block of @NgModule as following. We can use custom validator Directive with formControlName, formControl and ngModel. Find the HTML template code snippet for template-driven form with our validator Directive. Here we will use built-in validators such as required, email for conditional validations. Suppose we have three notification mode i.e. 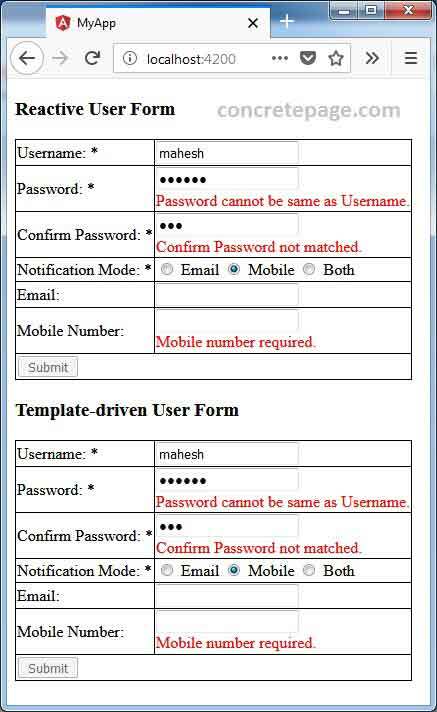 email, mobile number and both and we want that if email is selected then validation should be applied only on email field, if mobile number is selected then validation should be applied only on mobile number field, if both option is selected then validation should be applied on both fields email and mobile number. To achieve this conditional validation we can use valueChanges or expressions that returns boolean value. valueChanges will be helpful in reactive form. Suppose we have getter properties for notification mode, email and mobile number as following. Now subscribe valueChanges of notificationMode property and set and clear validators as following. To perform conditional validations with formControlName, formControl and ngModel using built-in validators, we can use build-in validator Directives. For example if we write [required]="false" then required validation will not work and if we write [required]="true" then required validation will work. Find the code snippet to perform conditional validation in template-driven form. <input name="email" [required]="mode.value === 'email' || mode.value === 'both'"
Here we will provide complete code to perform reactive form conditional validation using valueChanges property and updateValueAndValidity() method for custom and built-in validators. Here we will provide complete code to perform template-driven form conditional validation using custom and built-in validator Directive. We have already created our custom validator Directive above in the article for conditional validation for username and password and confirm password i.e. matchForUsername and cnfPassword. Here we will use them. Find the complete template-driven user form code. Enter the data into user form and if form is not validated, we will get error messages. Find the print screen.